Like its predecessor, No Return, the second novel of Jeroun follows two converging story lines - the first featuring the triumvirate of Vedas, Churls, and Berun, and the second featuring the scientist/magician Pol. It's a narrative format that echoes the first novel quite nicely, creating a natural flow or connection between the two, but that's really where the similarities end. 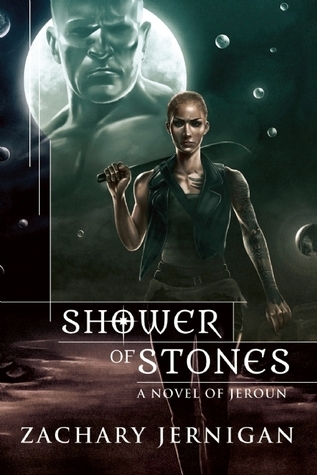 As hard as it may be to believe, Shower of Stones is a darker, more complex, more philosophical novel. Zachary Jernigan really takes us beneath the surface of that first narrative to confront what it means to be human, to be in love, and to hold onto hope for a better tomorrow. That's not to say that this is a shiny, happy, hopeful fantasy - far from it! - but we're climbing towards the possibility of a future, rather than towards an end. The opening chapter or arc of a novel really serves to set the tone for what comes after, and Jernigan sucked me in immediately. He takes us deep into the history of the world of Jeroun, to a time before Adrash was the only god in the sky, and fully fleshes out a mythology that was only hinted at in the first book. We meet the gods (demigods?) whom Adrash created to keep him company and to provide a sense of a family, and witness firsthand as his depression and his madness drive them to wage war upon a world and attempt to drive him from the skies. It's a fractured, damaged, incestuous family dynamic that evokes memories of Greek mythology, but which is something entirely new and exciting. In the second arc, he takes us deeper into the heroes of the first book, revealing the heart and soul of Vedas, Churls, and even Berun. Whereas No Return was largely a story of mistrust and animosity, Shower of Stones is one of trust and friendship. The seeds of character development planted in the first book are allowed to take root and blossom here, driven in large part by a mysterious new character who announces himself by arriving on the back of a dragon. I won't say much about him, as his secrets are a cornerstone of the book, but I do have to say a few words about Fyra. As much as I liked the mystery and the cryptic nature of her presence in the first book, I was excited to see her become a character here, extending the heroic triumvirate into a quartet. This arc is certainly the longest of the novel, eating up far more pages than (on the surface) seems wise, but somehow Jernigan makes it work. It's a long period of talking and philosophizing, without a lot of action, but the internal conflicts really work to expose the significance of the first arc, and to bring the two of them together. The final arc involves, of course, the final confrontation with Adrash. Again, there's not much I can say here without spoiling things, but I was pleasantly surprised by how it all played out. I thought I knew where Jernigan was taking the story, but he weaves in some twists and turns that keep you guessing right to the end. Anybody getting a bit antsy over the lack of action in the second arc is well rewarded here, as everything comes together, with gods and heroes carving out a new mythology. What's refreshing, however, is that he doesn't allow the mythology to overwhelm the human element, and doesn't allow the war between gods to push the heroes to the background. It's a delicate balance when dealing with such very different forces, but I loved the way everything intertwined and came together. Shower of Stones is a very different book from No Return, both in terms of content and pacing, but somehow it all works. It's not as edgy or innovative as the first, but it's deeper, more well-rounded, and more . . . well, significant is the only word that comes to mind. Well-rounded is good, especially if there is more character development. "It's not as edgy or innovative as the first, but it's deeper, more well-rounded, and more . . . well, significant is the only word that comes to mind." I knew in writing it that I wasn't... pushing so much. I wasn't trying to be super weird or reinvent the wheel. At the same time, I was hoping to do better at making a connection with the reader and just, I don't know, write better. To think that I achieved some of what I set out to do -- for you, at least! -- means a lot. Thanks for taking a chance on it!